A minor British drama that’s part medical procedure and part disaster movie; Val Guest’s ‘80,000 Suspects’ is a decent entry in hospital dramas that benefits from a terrific cast and intelligent script. One New Year’s Eve in the Southwest of England, Dr Stephen Monks (Richard Johnson) discovers a smallpox infection which causes the city of Bath to be put under quarantine. At the same time, Monks marriage to ex-nurse Julie (Claire Bloom) is falling apart following an affair, but becomes even more tested when Julie contracts the virus. Further strain is put on the couple when the disease is traced back to the woman that Monks was cheating with (Yolande Donlan), a family friend who has since gone into hiding and must be found before it’s too late. Overlong but mostly engrossing, ‘80,000 Suspects’ is a bit soapy but well worth sticking with. The British cast is very strong, with attractive lead actors Richard Johnson and Claire Bloom on fine form here. Also good are Cyril Cusack as a local priest with a few vices of his own, and Mervyn Johns as the policeman in charge of it all. Writer-director Val Guest had earlier made the excellent Sci-fi’s ‘The Quatermass Xperiment’ (’55) and ‘The Day the Earth Caught Fire’ (’61), as well as the superb police procedural ‘Jigsaw’ (’62). There is a degree of dread here and there and I like the wintry feel the film has, adding a coldness to the already tense atmosphere. There is also a healthy dose of romance here which helps lift the story from all the doom and gloom. A well made panic-laden melodrama, ‘80,000 Suspects’ is a largely forgotten movie but one that definitely holds up today. 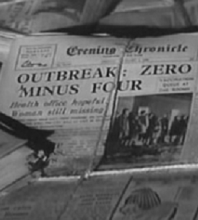 With a very strong cast and Val Guest’s excellent script, it may be 55 years old, but it’s a timely reminder that while the likelihood of an epidemic is very rare, the threat of one is still unnerving today.